How good was it to start the season over the last week, with all players playing!! It was a great start on Friday night (U12, U14, U16, U18, matches – together with 7s and 9s training and Milo in2Cricket). On the weekend, I was able to see part of our younger Junior Teams (2x7s and 1 x 9s) play in the new formats – and then our Girls Team last night!! I can see we will be having a great season ahead!! 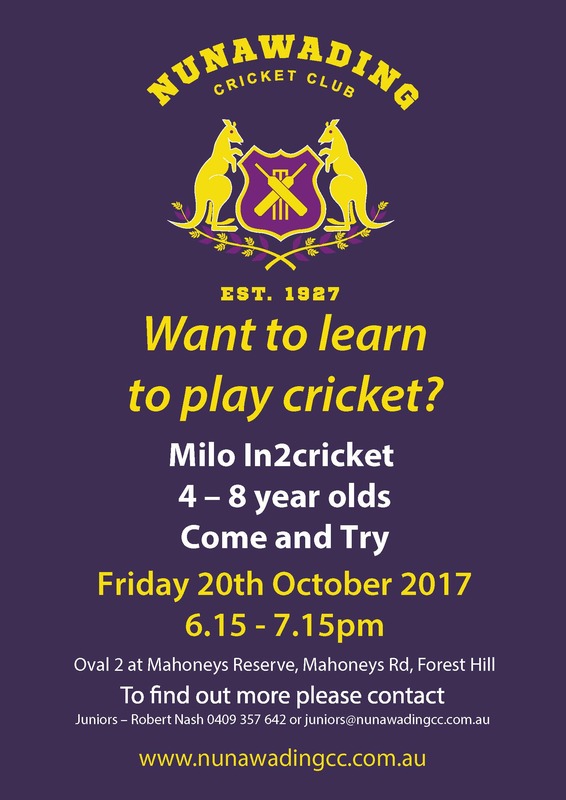 Tomorrow night is the official Nunawading Cricket Club – Junior Season launch. Whilst we always encourage all families to come back to our Club Rooms after Friday matches, training and Milo – tomorrow night is a special night. On top of pasta and pizza from our Sponsor Piccolinnos, we will also have some sausages. Additionally, we will also have our match presentations from all teams – and some special FORMAL PRESENTATIONS. Can I please ask that everyone who can, does attend. Food will initially be ready to be served soon after 7.00pm, and there will be further warm food available from 8.00pm. I anticipate formal presentations to commence from 8.15pm – and be completed by 8.45 – 9.00. I know this may be late for younger families, but it will be a great night!! Whilst I am very confident matches, training and Milo will go ahead tomorrow night, it is timely to mention/remind everyone what happens in inclement weather. ALL MATCHES ARE DEEMED TO PROCEED, unless you hear something different from your Team Manager. Our next apparel order is due next week, so if you have any outstanding orders, our Apparel Manager (Derek) will be in contact with you very soon! !